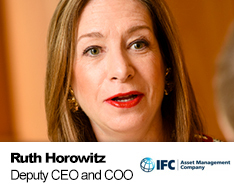 Ms. Horowitz is the Deputy CEO and Chief Operating Officer of IFC Asset Management Company, LLC and joined the business at the start of its operations in 2009. She is responsible for the strategy and operations of the business and sits on the investment committees for all funds. Prior to joining AMC, Ruth was a Managing Director and the Chief Administrative Officer of Lehman Brothers’ private equity business, which had more than $20 billion of assets under management. She held this position for nine years, and she has more than 20 years of experience in investment banking. Ruth was also a member of Lehman Brothers’ Fund of Funds Investment Committee. Before joining Lehman’s private equity business, she was a senior vice president in investment banking working on strategy and business planning, a senior vice president and chief administrative officer of its Equity Research department, and a vice president of its Equity Capital Markets and Debt Capital Markets departments. Ruth is active in several non-profit organizations and is a member of the boards of the New Museum of Contemporary Art, Barnard College, the Educational Alliance and the Forward. She and her husband, Michael Nachman, live in New York and Washington, DC.